Our History - Scott County Partnership, Inc. The Scott County Partnership, Inc. is an exciting way that the people of Scott County (business leaders, educators, civic leaders, faith community, social service and other organizations) join forces in a collaborative process to create new systems and address long term community challenges. The idea of the Scott County Partnership was born in 1995, when community leaders believed that if all people and systems currently in place share a common vision, work together and maximize resources, then we can solve many of the challenges we face. The Partnership was formalized with bylaws in 1997 and incorporated in 1998. A 30-member board of directors and several committees meet frequently to envision and to plan. Partnership staff facilitate communication, coordinate activities among diverse groups, compile action plans, and secure finding for community initiatives. Today’s world is very complex. We need personal, community and social or economic networks to survive. Positive outcomes come through an emphasis on networking through relationships and incorporating the very best of community ideals we use local resources, volunteers, businesses, churches, agencies and governmental entities to meet local needs by connecting people in partnerships. Positive outcomes are occurring in Scott County…. Through Partnership. The Scott County Community Clearinghouse (now known as the Nelson Spaulding Community Clearinghouse) was envisioned by the community and built in a day by the community in 1999. It exists as both a system and a building helping those less fortunate in our community. 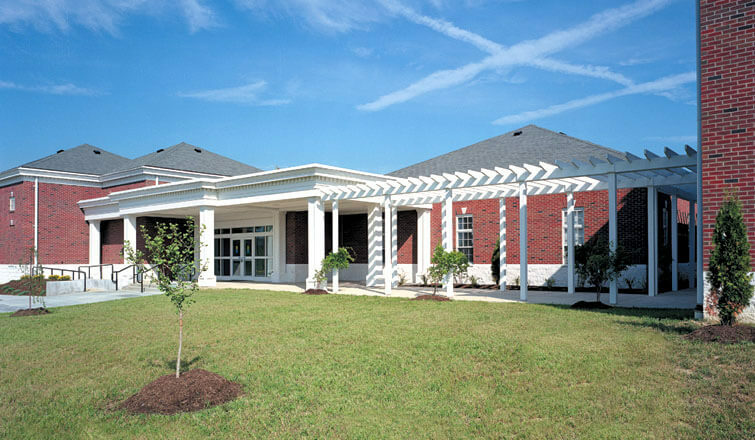 The LifeLong Learning Center (LLLC) opened in 2001 as a result of a community visioning process led by the Scott County Community Foundation for the purpose of providing a variety of employment and training services to Scott County residents. Initially, it was a one-stop center to address workforce and adult educational needs for Scott County. In 2002, the LLLC opened the Industrial Training Center where Industrial Maintenance training was provided. As the needs for employers and for training increased over time, the Mid-America Science Park opened in 2011 to provide a location where more training with advanced manufacturing skills could be offered. The LLLC continues to be a place where basic level education is provided prior to the need for higher level training and education. In 2001, the Scott County Community Foundation approached the Scott County Partnership to request assistance in writing a CAPE grant to Eli Lilly Foundation. Carolyn King, the Executive Director of the Partnership at the time, initiated focus groups and interviews seeking information from the community. She, along with the community, wrote both the planning grant and the CAPE grant. As a result of those efforts, Scott County received a $5 million grant from Eli Lilly for educational initiatives. Initial CAPE goals were addressed and continue to create positive educational and lifelong outcomes by creating a web of support and technology for Scott County families. Goal 1: The Scott County high school drop-out rate will decrease due to targeted intervention with youth at risk for educational failure. Goal 2: An increased percentage of students and adults in the community will access higher education opportunities. Goal 3: Employers find new applicants computer literate and ready for today’s workforce. Goal 4: Family members understand their role in their child’s educational success at each developmental stage and participate actively in their child’s education. Goal 5: Education will be articulated as a valuable resource throughout the community. The Scott County Community Foundation was the conduit for this grant. Scott County School District 2 served as fiscal agent. The Scott County Partnership was the entity who administered this grant for the initial three years and then for the four-year extension.